Selling cloud is not easy, but it has just gotten simpler for SAP partners. For many partners selling cloud solutions means making a big shift in their operations, figuring out how they anticipate and recognize revenue, beefing up their marketing and sales bench and adding new capabilities so a customer’s hybrid environment is humming along. What really becomes the Achilles’s heel of cloud selling is having that billing, invoicing and contracting operation in place that understands all the nuances of cloud. And, for some tech partners that’s a headache and they rather shy away from that and focus their energies on what they know with on-premise deals. Well, partners no longer need to be gun shy about stepping into the cloud, because SAP has recently rolled out a go-to–market cloud sales program that takes the headache out of selling cloud. The recent debut of SAP PartnerEdge Cloud Choice, profit option now carves a simpler path for partner who want to sell cloud without getting bogged down in the weeds. SAP PartnerEdge Cloud Choice, profit option is designed specifically Sell Partners. As a key sales enabler, it is an integral new part of the SAP PartnerEdge program. SAP partners get paid a 20% fee for the annual contract value for cloud deals and manage the lead gen, sales, demo and implementation. As part of the model, SAP manages the contracting, invoicing and collection and software support. 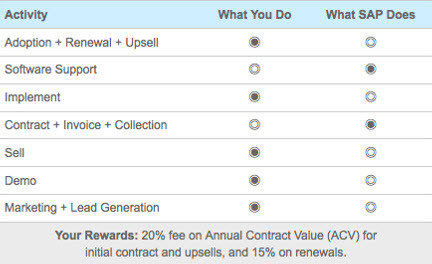 Also, partners can make 15% for renewals of those deals, too. See the chart below. The good thing about this cloud sales model is that a Sell Partner can choose to leverage it for all its deals or some where it make sense for them and eventually transition to the higher margin cloud sales of reselling cloud. Either way, the new cloud choice profit option is a great way for partners to provide customers with the efficiencies and benefits of cloud without having to incur huge upfront investments in shifting or increasing internal operations.